Are you solely using WordPress to build your membership site? Then you might want to know that WordPress user meta becomes incapable to store your user’s additional information. To list your WordPress users and their metadata installing a membership plugin could be a good idea. A membership plugin helps you store custom user data, like extensive user registration form data. This task can be even achieved with WordPress user meta to some extent. But in order to extend the field type of your default user meta, taking help of a plugin is a good idea. Also, default WordPress user metadata will not allow you to list your WordPress users and their metadata on the frontend of your site. Which is very important in case of a membership site since each user’s profile remains visible to other members of the site. Also, it becomes easy to retrieve the data that is already stored. Now, the ProfileGrid plugin is exclusively designed to take care of all these requirements of a membership site. From custom registration forms to beautiful user profiles and separate pages for listing user metadata ProfileGrid helps you achieve all in a few clicks. Now, first let’s give you a clear sense of what exactly is a user metadata. Metadata usually refers to a set of data that describes and gives information about other data. The word Meta here works as a prefix which in information technology language means “an underlying definition or description”. The metadata describes or provides the basic information about a data so that finding it or working with it becomes easier. To give you a clear conception, let me give you the example of the library catalogs that make it easy to find books in a library. They contain the title, publisher, author, category, genre and location of all the books. Similarly, metadata holds all these information to filter your search and make you easily find a specific user or document. The utility of metadata in a web page is very significant. A webpage metadata contains description about the page’s content and the keywords that are linked to the content. In case of a membership site, the user metadata will hold all the information of your users. This, in turn, will help you to filter your search on common fields. For example, suppose there are 12 users from Canada among 100 members on your site. You can find them on the common field of their location if your site’s meta contains the user location field. The smartest utilization of WordPress user metadata has been done by social networking and business directory sites. The constant procuring, managing and listing of user database is the key to their business. Doing so, they have benefitted many lives. Now, the process of creating user metadata in ProfileGrid is done through the Custom Fields of the plugin. These Custom Fields store your registered user data as user meta so that one can retrieve them later. In ProfileGrid you can add custom fields in user registration forms. These fields display their values in the Group Page or Search Page in the frontend of your site. So, without wasting any more words, let’s show you how you can list your WordPress users and their metadata with ProfileGrid. Right after installing, the ProfileGrid menu will appear on your WordPress dashboard. From there, click on the ProfileGrid menu item. You will land on the Group Manager page. By clicking on the Add New link on the top left corner, you get to create new groups. From these groups, you can start taking new users on your site. 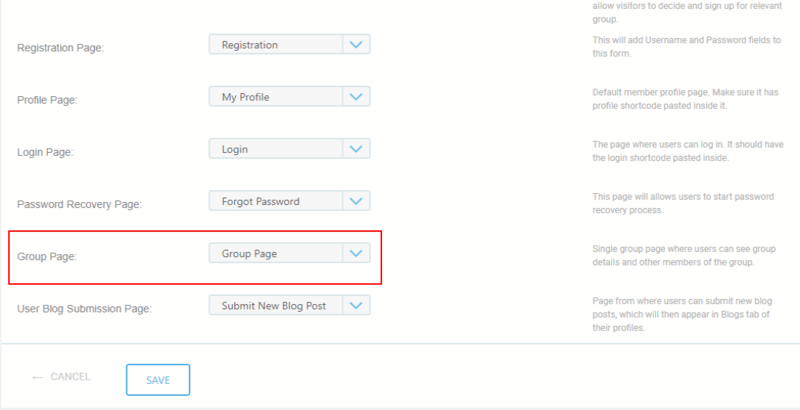 Now, on the Group Card of each group, you will find two links – Settings and Fields. Once you click on the Fields link a pop-up will appear with all the custom fields. By applying these fields, you can create your registration form. 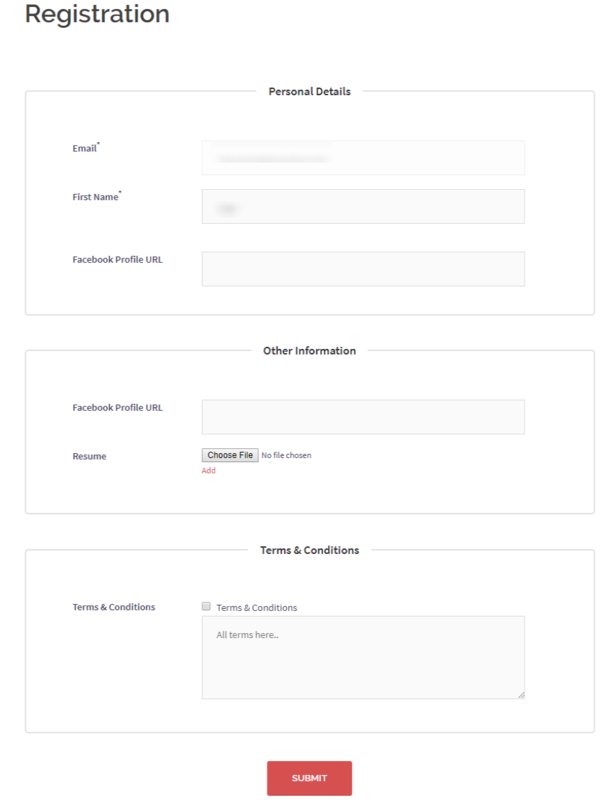 Given below is an example of a single page registration form. You can also display multi-page registration form in WordPress with ProfileGrid. As I said earlier, these fields that you add in your form except the password will become a part of your WordPress user meta. So now you can list your WordPress users and their metadata on your site. ProfileGrid offers a set of predefined shortcodes in its Shortcode page. These will help you to create vital pages on your site in just a few clicks. Just copy these shortcodes, paste it in a new WordPress page and done! 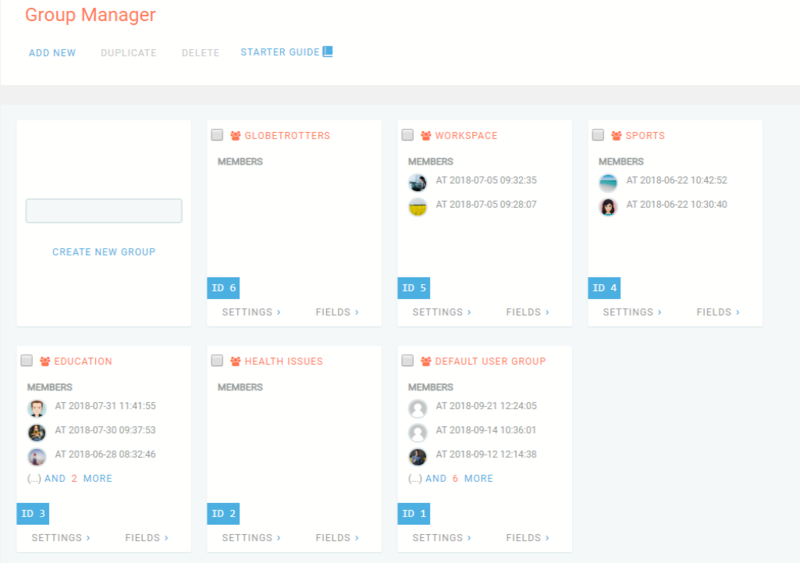 The plugin even provides default pages like PM Profile, PM Groups etc. where you have to paste their particular shortcodes. From the shortcode page, we will copy the [PM_Search] shortcode which will create the All Users Page. Paste it in a new WordPress page since the All Users Page is not a default ProfileGrid page. Then publish the page to make it appear on the frontend. 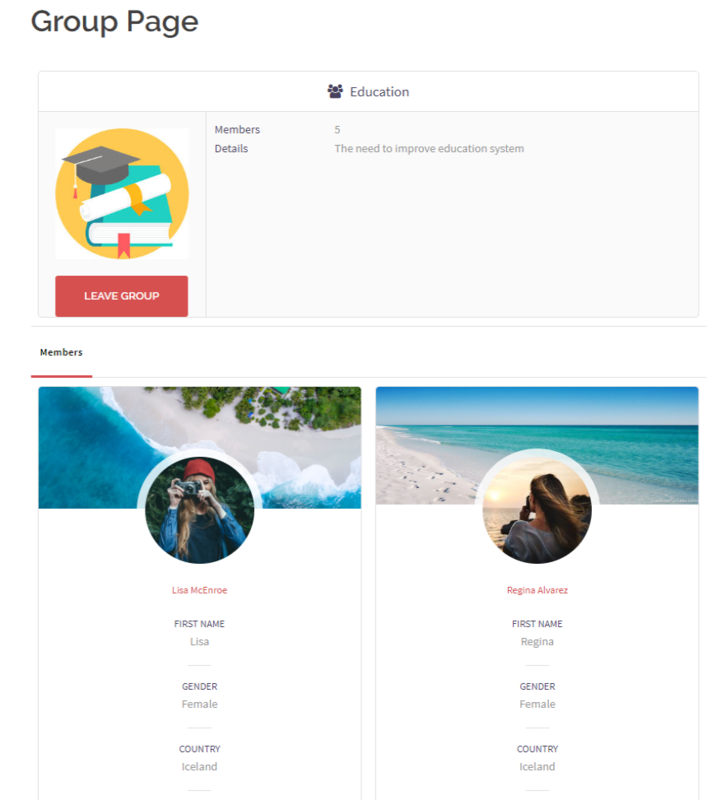 Given above, is a front end view of the All Users Page. You can see, there is an Advance search option that provides the Custom Fields that help you filter your search. For example, suppose you select the Facebook Url checkbox. Then the users who have provided their Facebook Url on registration forms will appear here. However, you can reset your search to select other fields as well. 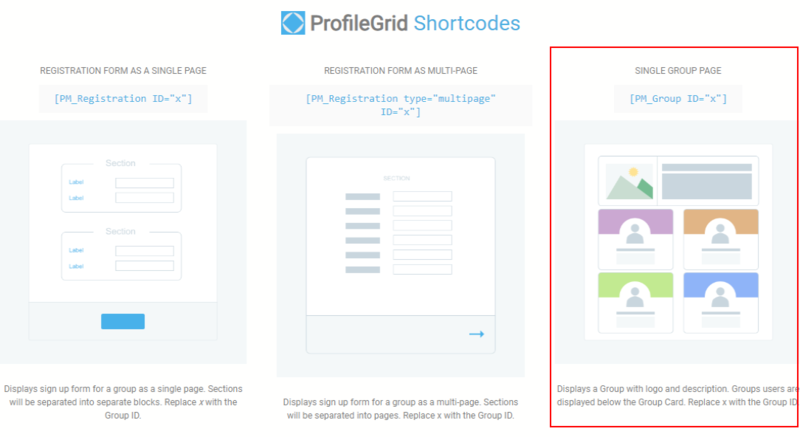 In the same manner, copy the Single Group Page shortcode from the Shortcode page. Paste the [PM_Group ID=”x”] shortcode in the default Group Page. Here, replace the value of “x” with the group id of each group to form their own group pages. Then, publish it. Now, every default ProfileGrid page needs assigning to make it appear on the frontend. So, go to the Global Setting menu and click on the General link. You will find all the default pages there. Next, from the drop-down beside Group Page assign your newly created group page and click on the Save button. By assigning a default page you make it appear in your site menu. Now, go to the front end of the site a select the Group Page of your own Group. Above, you can see a Group Page of mine. The users are listed there and when I select one user I will be able to visit their profiles. Wasn’t that an easy and elegant way to list your WordPress users and their metadata? Now, I have earlier told you that WordPress offers its default user metadata listing. You can find it from the Users menu on your WordPress dashboard. However, default WordPress registration form doesn’t provide you with custom fields. Thus the default WordPress user meta will only contain the username and email id of the users. Moreover, you won’t be able to display it on the frontend. Needless to say user metadata is of immense importance in online businesses especially e-commerce sites. It helps in data tracking by recording the locations, genders, interests, preferences of their customers. ProfileGrid also offers you the opportunity to transform your membership site into an online store. It provides extensions such as WooCommerce and Stripe to integrate these plugins in a single click. Then, you can even allow each user to buy and sell products from their own profiles. Also, the admin while selling products can give their customers individual profiles. The advantage of these profiles is that they can interact with each other, post blogs and share media on their group walls. Your users can even create their own frontend groups and start their own community within your site. So, keep growing your business with ProfileGrid because you don’t need to be a pro developer to create your own membership site. The plugin lessens most of the manual jobs letting you focus on your business. To share your thoughts on ProfileGrid or to receive the recent updates visit our Facebook page. How do you change how many you can display on the Group page? It looks like it is currently set to 10. Is there a way to make more display? Unfortunately, as of now, ProfileGrid do not have the feature to change no. of members displayed on the group page. However, we have made note of this requirement and will review it for possible inclusion in future release. It is possible to order users by date of register or more recently added. In the example of search page: you filter by metadate exist or not. But it is possible to filter by the value of that metadata. For example country: Argentina, Brazil, Chile? 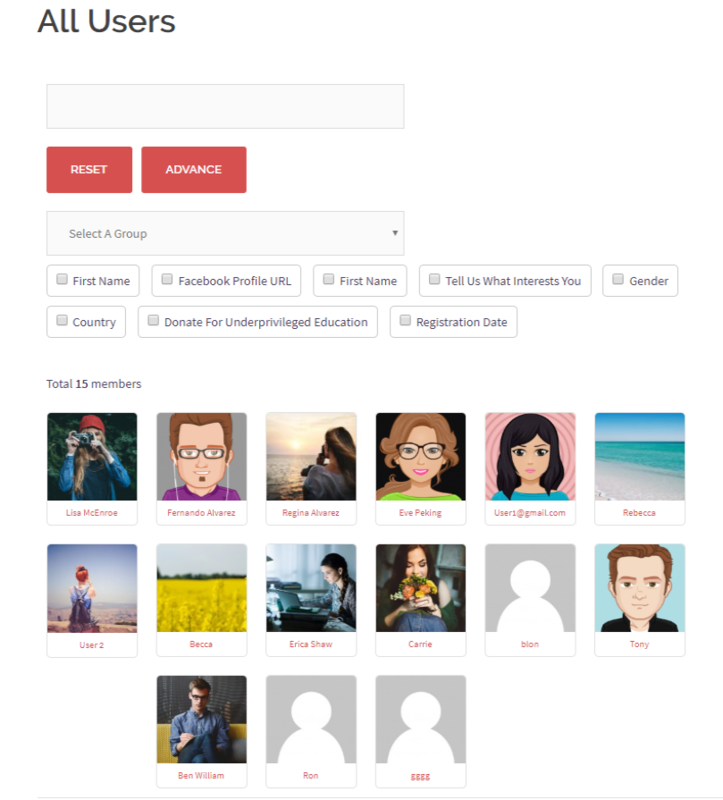 I would like to create a unique registration form for all users and allow them to choose a group. Can I do that? As of now, ProfileGrid doesn’t provide a single form for registration to multiple groups. Also, order by register date and filter by metadata value isn’t currently supported by ProfileGrid on the front-end search page. However, we have added this to our requested features list and will include it a future version update. Once included, you will get an update via the plugin’s changelog.